INDIA FACES serious challenges to sustain its water resources as agriculture, industry and domestic sectors compete with each other for the scarce resource. The situation is exacerbated by poor water management practices, over-extraction of surface and groundwater and pollution. Unfortunately, there is a lack of reliable data about the total potential of water resources and supply and demand of water. Rainfall, India’s primary source of freshwater, is estimated to be 4,000 billion cubic metre (BCM), but it varies widely across states, seasons and years. The Planning Commission’s Steering Committee on water resources for the 11th Five Year Plan reported that India’s water resources potential is 1,869 BCM, including groundwater. This is when “utilisable” water resources have been assessed at 1,123 BCM, of which 690 BCM are from surface water and 433 BCM from groundwater. Besides, the surface water estimates have remained unchanged for several decades—the National Agricultural Commission report in 1976 and subsequent estimates by the Central Water Commission in 1988 and 2001 have mentioned this number. But Planning Commission’s working group for the 12th Plan said it failed to locate any document explaining the basis for the estimate. Assuming the availability of 1,869 BCM to be accurate, India will move from a water-adequate nation (per capita availability of over 1,700 cu m/year) to a water-scarce one (per capita availability of less than 1,000 cu m/year) by 2025 (see ‘Every drop counts’,). Nine of 20 river basins, supporting 200 million people, are facing water shortage. Groundwater is another area of crisis. India is heavily dependent on groundwater and is the largest consumer of groundwater in the world. The Central Groundwater Board in its 2012-13 yearbook reports that India drew 243 BCM of groundwater in 2009, which is 61 per cent of the country’s net available groundwater. With no dedicated national groundwater management programme, groundwater stores are being depleted at rates faster than they can be replenished. Nationally, 27 per cent of the blocks are classified as semi-critical or worse (withdrawal in excess of 70 per cent of availability). Northwest states draw 127-170 per cent of the available groundwater. Increased water consumption results in higher water discharge, leading to degradation in water quality. Today, industries are the main cause of water pollution. Let’s first consider the story of evolving water needs as India transforms from a country with vast rural population dependent on agriculture to one that is relatively urban and industrialised. 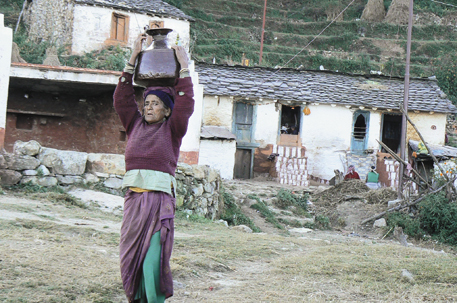 About 70 per cent of Indians live in rural areas. Agriculture needs account for 88 per cent of total water consumption, while industrial use and domestic water consumption by urban residents account for the balance 12 per cent of usage. The situation in rich industrialised countries is the reverse. However, as India develops, it is unlikely to urbanise and industrialise to the same extent as the developed world. Around half of India’s population is expected to remain rural by 2050 for whom agriculture will be the mainstay. Water for irrigation will remain a significant contributor to the country’s total water needs. Nevertheless, rising urbanisation will result in increased domestic water consumption: urban dwellers use far more water than rural folks on a per capita basis. Industrial water needs will also increase in line with GDP increases. India’s current water policy rightly accords priority to domestic water. Agriculture needs will also remain important to feed the growing population and support livelihoods of half the country. Given significant water use by the agriculture sector, improving irrigation efficiency will be critical to managing overall demand for water. As water supply gets constrained, competing demand from various sectors may lead to conflicts. Else, industry will be under tremendous pressure to improve water efficiency or risk facing serious obstacles to growth. Information on water demand—both current and projected—is unreliable. The National Commission on Integrated Water Resources Development (NCIWRD) projected water requirement for various sectors in 1999. The Ministry of Water Resources (MoWR) produced another set of estimates in 2000. NCIWRD’s estimates of water use for agriculture are lower than the ministry’s estimates since it assumes improved irrigation efficiency. Conversely, NCIWRD’s estimates of other uses (such as industry and domestic) are much higher than that of MoWR’s. NCIWRD’s projected combined water use by industry and energy sectors stands at 56 BCM for 2010, while MoWR pegged it at only 17 BCM. Going forward, the difference widens: NCIWRD projected water consumption by industry and energy sectors to be 100 BCM by 2025 against only 38 BCM projected by the ministry. The absence of a national water database has been recognised as a serious shortcoming by the government. The 12th Plan envisages comprehensive aquifer mapping and development of a water database that includes assessment of national water resources potential and end users (by sector) of water. Various research reports agree that the demand for water by the industrial sector will show a sustained increase. However, the underlying assumptions vary, resulting in widely different projections. For instance, NCIWRD estimates were based on water use of a small sample of companies. While the total water usage by industry and energy appeared reasonable, the split between energy and industry seemed wrong. On the other hand, MowR had projected inexplicably small water consumption (totalling 17 BCM in 2010) by the industry and energy sectors and then went on to project an extraordinary growth over 40 years. Recently, there have been attempts to refine these numbers. The International Water Management Institute (IWMI), Colombo, has projected industrial water need based on elasticity of demand with respect to GDP. Domestic water has been estimated based on increased urbanisation and increase in coverage of households. IWMI estimates show that the share of consumption by the industrial and household sectors will continue to rise, accounting for a massive 54 and 85 per cent of the incremental water demand by 2025 and 2050. One curious feature of the Indian industry is that development has occurred without considering water availability. In fact, some of the densest industrial clusters are in water-stressed states. A natural consequence of concentrated industrial activity has been significant pollution levels in both groundwater and rivers around the industrial clusters. Exclusive extract from State of India’s Environment 2015, an annual publication of Down To Earth and Centre for Science and Environment.